This is a universal valve that fits a number of brands and models of top load washers including Whirlpool, Sears, KitchenAid, Roper, Estate, GE, Frigidaire and others. 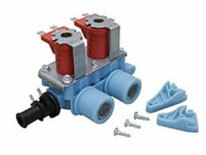 The washer water inlet valve is an electrical device that controls the flow of water during the fill cycle. The water valve can be located by following the inlet hoses from the wall to the washer. The hoses attach directly to the water valve. Water valves usually fail to flow one temperature (hot or cold) at a time. The valve can also fail to shut off the water flow when the washer is unplugged. Both hot and cold water failing to flow at the same time is usually not the water valve. Measure voltage at each coil when washer is set to fill. If there is 110 volts across the coil and water is no flowing, the valve is bad. If water continues to flow when washer is unplugged, the valve is bad. Bring your “water valve” in for free confirmation that it is good/bad or call the U-FIX-IT store for free assistance with diagnosis.